All Lift Chairs returns the Golden PR-401 Lift Chair! November 2 –- Raleigh, NC -- All Lift Chairs, an online retailer of lift chairs for the disabled and elderly, is pleased to announce the return of the Golden PR-401 Lift Chair. 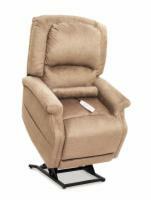 "We are happy to welcome back the PR-401 back," said Tim Ziehwein, Vice President of sales at All-Lift-Chairs.com. "The PR-401 is one of Golden Technologies most recognizable chairs, because it features Golden’s industry-leading SofTouch fabric at its lowest available price." The Golden PR-401 Lift chair is a three position lift chair upholstered in Golden’s SofTouch, a luxurious designer fabric with a stain-free finish. "People are complaining all the time about their chair only lasting a few weeks, or less than a few weeks, before one of their kids or grandkids spills something on it, and the PR-401 goes a long way toward solving that problem." The Golden PR-401 will be available immediately from All Lift Chairs, and pricing will start at $729. All Lift Chairs is an online retailer of lift chairs and mobility lifts for the disabled and elderly. Their products include massage chairs, bath lifts, and walk in tubs. For more information, visit them online at www.all-lift-chairs.com.